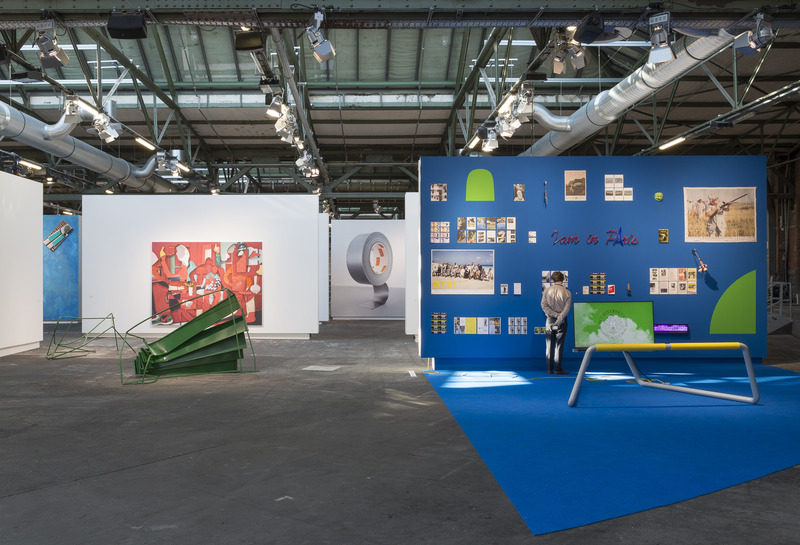 This year sees the ninth edition of abc art berlin contemporary, galleries from Germany and around the world presenting individual positions and curated projects inside and outside the exhibition halls. As promised in the foreword of this year’s programme, the focus of Berlin’s biggest art show is on artistic practice, and the innovative presentation of artworks. Upon entering the hall you’re immediately welcomed by a sleek army of well-dressed gallerists, artists, and art friends mingling at the hot spot (take note: this is one of the rare events in Berlin that raise the dress code from runners to heels). Naturally, some of the most interesting artist presentations are also located at the very start. If you arrive at the right time of the day, the Mehdi Chouakri booth will put a twinkle in your eye with works by Saâdane Afif that come into poetic play with the sunrays penetrating the airy space. Few steps away, Esther Schipper confronts you with an elaborate reference-fueled installation by Cristopher Roth, while Capitain Petzel takes up the other side of the wall and spreads throughout the space with paintings and sculptures by Monika Sosnowska and Pieter Schoolwerth. Monika Sosnowska and Pieter Schoolwerth @ Capitain PetzelAn interesting constellation of artworks can be found somehwere in the middle. 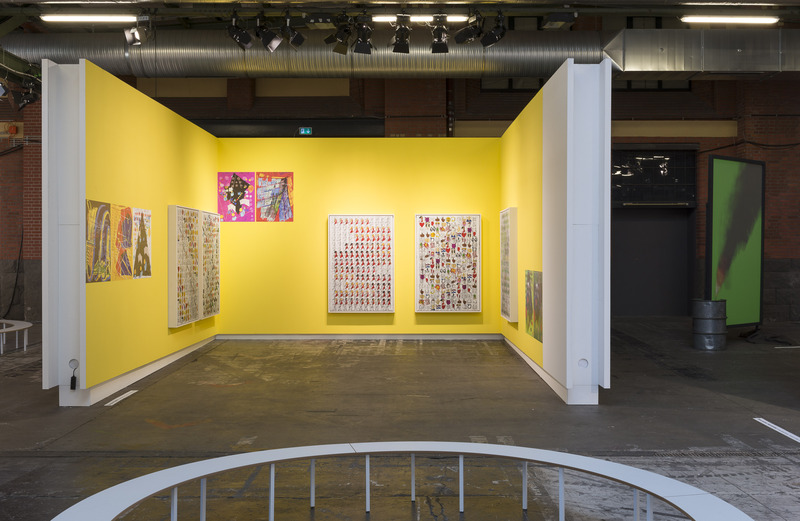 Here the square meters and cool points are distributed between pseudo-romantic stage-set installation by Simone Gilges (KM Galerie), chatty emoji paintings and color-savvy prints by Despina Stokou (Galerie EIGEN + ART), and Laure Prouvost’s installation premiering her new tapestry piece. Laure’s incredibly detailed and layered compilation of old and new works lures you into its web of meanings and jokes, and spits you out wearing a bemused grin. Good news for fellow fans: the artist will be present and perform “From the Sky” today (Friday 16th) at 17h at Station Berlin. Laure Prouvost at Carlier GebauerAt the end of the hall, slightly cut-off and slightly shadowed by the nearby entertaining and very instagrammable works of Erwin Wurm (König Galerie) and Kenny Scharf (Galerie Hans Mayer; see cover image), BQ gallery has set up one of the most compelling abc shows in a separate room, seizing the luxury of intimate space for Raphaela Vogel’s immersive multimedia installation, which councludes the abc story with an unexpectedly scary cherry on top. After that, the only thing mandatory is revision of impressions with diverse crowd of visitors at the food & drinks stands. While the fair itself certainly offers enough input for the weekend, not only with the presentations, but also with an exciting program of events taking place on Saturday and Sunday (more info here), we can’t overlook the big Friday gallery night when all participating Berlin galleries open exhibitions in their gallery spaces. Read about our favorites next week, and let us know about yours.